Varna is a rock band out of Los Angeles, CA that has been building a strong following through hard work and obvious appreciation for their fans. 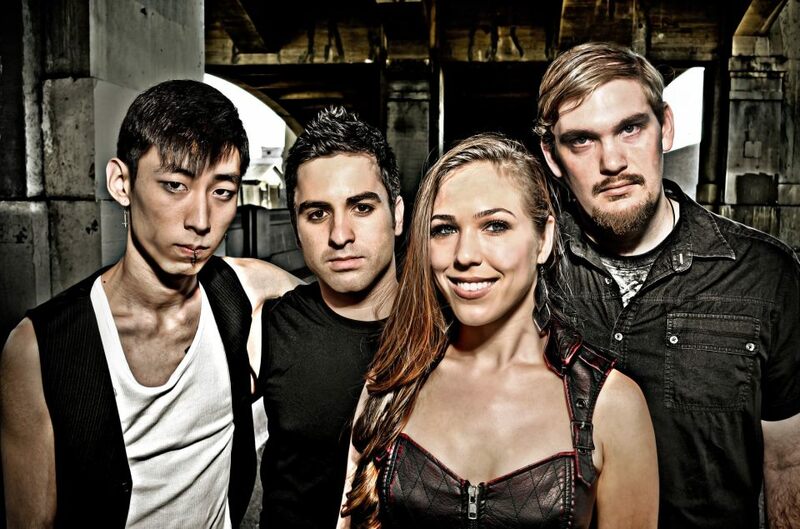 The band is made up of Tiana Woods on vocals, Rossen Pinkas on guitar, Robin Mordecai on bass, and Rob Shin on drums. Below is our interview with their great vocalist Tiana. BS: How did you come up with the name Varna? TW: The name VARNA is a source of symbolism for us. It was the street our rehearsal studio was located on. Ross, our guitarist, is from Bulgaria and Varna is the one of the biggest cities there. Also, one of my favorite books is ‘Interview With the Vampire’ and the characters end up in Varna. We took it as a sign and ran with it. BS: What do you feel you bring to the rock genre that sets you apart? TW: I have always felt that we are the band that can co-exist with the separate rock and pop markets, which not many female fronted rock acts can do. Our aim is to be as widely accepted as possible. We just hope that both sides will accept us! BS: What is it like being a part of the band, Varna? TW: Since we finance this band 100% ourselves and we have no one helping us, the business side of it can be extremely stressful and time consuming. It is literally a 24/7 job, along with having our own full-time jobs. On the other hand, it is my greatest joy in life. Every day of my life since I was 4 years old has been to do this, so at the end of the day, I am happy to do whatever it takes. BS: What is it that you love about making music? TW: To be able to create a song out of your own creativity, perform for people and have them take notice and appreciate your art is the greatest reward in the world. I don’t think I can accurately put into words how much I love making music. BS: You have a new EP out called, “This Time, It’s Personal.” We reviewed it and loved it, what has the rest of the response been like for the EP? TW: It officially came out on February 15th but we had some advance reviews and they all were so wonderful! Just because you love something and put everything you have into does not necessarily mean that the world will think the same way. We are so excited that people have acted so positive towards it! BS: Your single off of the EP Down is a great and relatable song. I think that anyone can relate to various parts of the song. What was the inspiration behind the song? TW: The inspiration behind the song was an accumulation of a lot of things for me, but the main focus of the song is how you feel when the most important things in life are just are not working out for you. In this song, love and your dreams, which I think is such a universal topic for everyone. BS: Can you walk us through how one of your songs typically comes about being created? TW: We have a couple of different ways. One is that I go off and write lyrics by myself and Ross comes in with music that he has been working on and we match it up. The other way is when we are rehearsing; we take time to throw around new ideas, riffs and lyrics. Then we all scramble to record them on our phones so we don’t forget! BS: Can fans expect to see a music video for any of your songs? TW: We have an official lyric video for ‘Down’ which our friend, Damian from Awaken the Empire, created for the song. We would love to film a visual music video with all the band members for it in the future, so hopefully we can accomplish that. BS: Are there any plans for a tour to support the new EP? TW: Yes! We just got back from NAMM and we are off the Austin for SXSW in March. We will most likely tour the west coast since we are based in LA and branch out from there. BS: If you could go on tour with any band, who would it be and why? TW: Ross would say Slayer and Papa Roach. I would say Nickelback or Halestorm. Those acts have both impressed me live, they know who their fans are and they look like they balance professionalism along with having a great time, which I hope, is what we can achieve on the road. BS: What are your personal goals for the band? TW: I always say ‘a great band will never be heard if people don’t know about them’ so that is the biggest goal for us right now. Unfortunately, we don’t have the perks or money that a signed band would have in acquiring publicity. We just have to keep pushing ourselves into people’s faces, hope they like it, stay with us and spread the word. In the words of Bon Jovi, we are ‘livin’ on a prayer’. BS: Is there anything you would like to say to your fans? TW: Thank you! Thank You! Thank You! The sole fact that they care about what we are doing and love the music means everything to us. We have a handful of supporters online that really are cheerleaders for us and they know who they are. We have been quoted as saying that we ‘treat our fans like THEY are the ROCKSTARS’ and we mean that. We make sure to respond to every tweet, comment or letter that someone takes the time to write to us. They are priceless in our eyes.